After requesting permission for use of the Dr. Seuss drawings from Dr. Seuss Enterprises, I received a letter from their attorneys telling me no such permission could be granted, and that I needed to sign that letter and return it by a certain date. When I uncovered the letter here at my desk (that’s sort of like discovering something but not quite the same), it was a few days over due, so I called the attorney on the phone to explain the delay. In that conversation I mentioned the course had changed and that my daughters would be drawing the characters instead. She asked to see those drawings. I sent her those drawings, and the response was (and this is a loose quote), “No, you may not do that. The drawings still infringe on copyrighted Dr. Seuss drawings.” I’ll confess I had a feeling that was going to happen. I wonder what Theodore Geisel would say. Doesn’t matter. He’s dead. Because it’s getting to the point where any resemblance of those Dr. Seuss characters will not be allowable by Dr. Seuss Enterprises, and because it feels to me like the presence of those Dr. Seuss characters are essential to the meaning and/or aura of the collages and the book, I’m getting to the point of being tired of fighting and thinking maybe it’s time to throw in the towel on this one. But maybe not. There was a late-coming notion that the entire text could be set in Earthish (a phonetic alphabet and spelling of English I developed in my journals and in The Sphere 20 years ago), and that alone could be enough to carry this project into the future. I’ll talk to the illustrators here on staff about it (that would be my daughters, now ages 8 and 10), and maybe we can come up with a solution. You will be the first to know. 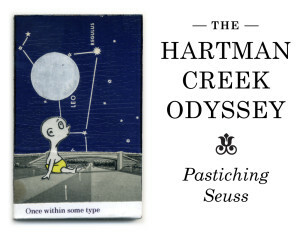 The Hartman Creek Odyssey is currently on hold until all the characters are redrawn by my daughters, scanned, vectorized, and photo-edited into the original collages to replace the characters drawn by the hand of Dr. Seuss, because, in a personal conversation with Susan Brandt, VP of Dr. Seuss Enterprises, I was unable to obtain permission for the use of the original characters. Understood. They protect the books, especially, I was told. Ms. Brandt also suggested I could draw my own characters and sell as many books as I want. So…here we are. The girls, ages 10 and 7, have done a remarkable job with the drawings, and it won’t be long before I have things cleared up. I’ll post more progress here, as it happens. For now, here is a look at one of the characters, redrawn by Trixie (7). With only 8 of the 26 copies reserved, I will extend the deadline for the pre-publication discount to December 31, 2013. 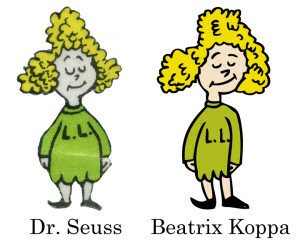 Most of the prospectus remains accurate, with exception of this switcheroo of the original Seuss drawings for the recreations. That, and maybe I will sell as many books as I can…in a subsequent edition, later. But for now we will stick to the original plan of a first edition of 26 signed and numbered copies That much I can promise. with a check payable to The Heavy Duty Press. Preview the dust jacket (pdf). Preview the opening end sheet (pdf). Preview the closing end sheet (pdf). Eight full color collages by Mister Koppa, created at a picnic table on campsite eight, at Hartman Creek State Park, in Waupaca, Wisconsin, with an accompanying story line in rhyme, complete this homage to the incomparable Dr. Seuss. For educational purpose, the various parts of speech are color-coded throughout the text, and a brief tract on the creative process is included in the nethermatter. The Hartman Creek Odyssey shall be the eighth title published by The Heavy Duty Press of Viroqua, Wisconsin, in November 2013 (and shipped in time for Christmas! ), binding 36 pages measuring 5 1/8 ” wide x 7 1/4 ” high, between hard covers, with printed end sheets and dust jacket. The first printing of the book shall be the only printing of this limited edition of just 26 copies, set in Century Schoolbook, and printed on 80 lb. White Finch paper. Signed and numbered copies (A—Z) of the edition may be pre-ordered for a 33% discount, bringing the post-publication price of $88 down to a mere $60. All this for the price of an iPod—a treasured tome to pass on through generations. Please reserve your copy by sending a check payable to The Heavy Duty Press. Orders will be fulfilled on a first-come-first-served basis. Be sure to include your name and address for delivery.